In my presentation on the publication history of The Sacred Harp at the opening plenary session of the Music Library Association’s annual meeting this past Friday, I concluded with some guidance on how to identify and distinguish among editions of the tunebook. The easiest way to distinguish among nineteenth- and twentieth-century editions of The Sacred Harp, I noted, is to examine the books’ front covers or title pages for the mention of appendices, the names of the lead revisors, and any dates. I’ve created a table with information on what to look for to identify a Sacred Harp edition in this way. But some editions have missing or illegible covers or title pages. For these cases I’ve devised what I call the “Page 37 Test,” a simple way to distinguish between seven different editions of The Sacred Harp. You can use the “Page 37 Test” to distinguish between the B. F. White-led editions of The Sacred Harp and each of the three twentieth-century revision chains: the “Cooper,” “White,” and “James”/”Denson”/1991 books. You can also use the test to distinguish between earlier and later “Cooper” and “White” books, and between the “James” and “Denson”/1991 editions. Benjamin Franklin White’s 1844, 1850, 1860, and 1870 editions all feature the song “China” in four parts and in D major on the top brace, and “Liverpool” in three parts and F major on the bottom brace. “China” and “Liverpool,” page 37 of The Sacred Harp, third edition, 1859. 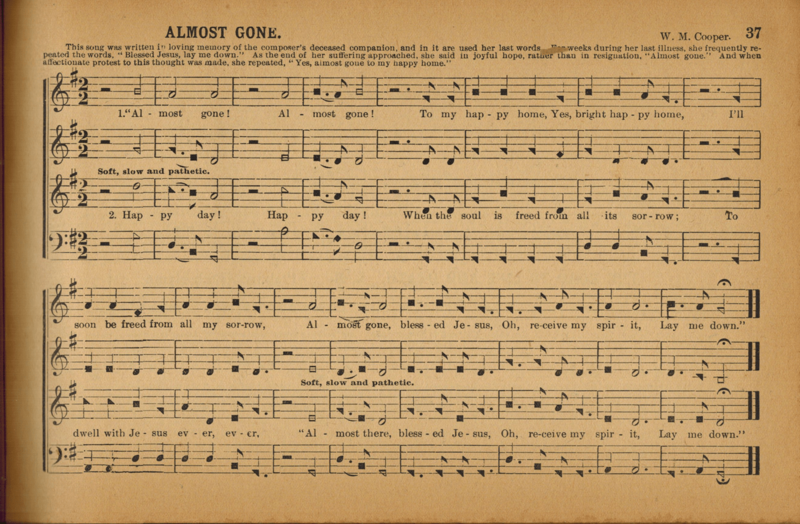 In 1902, Wilson Marion Cooper replaced these two songs with a composition of his own, a setting of his wife’s last words titled “Almost Gone.” Editions of the “Cooper book” published between 1902 and 1949 feature “Almost Gone” on page 37. “Amost Gone,” page 37 of The Sacred Harp, “Revised and Improved by W. M. Cooper,” 1927. 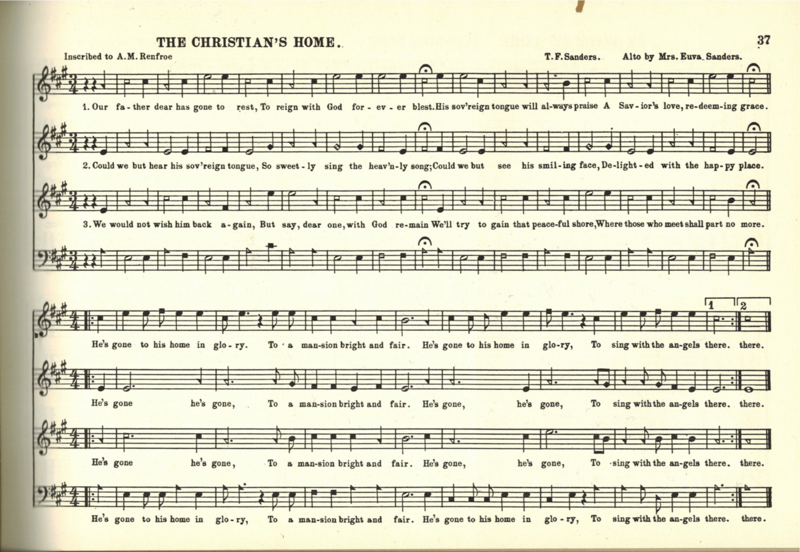 In 1950 and later “Cooper book” editions through the 2012 edition a new song titled “The Christian’s Home” appears on this page. “The Christian’s Home,” page 37 of The B. F. White Sacred Harp, 1960. 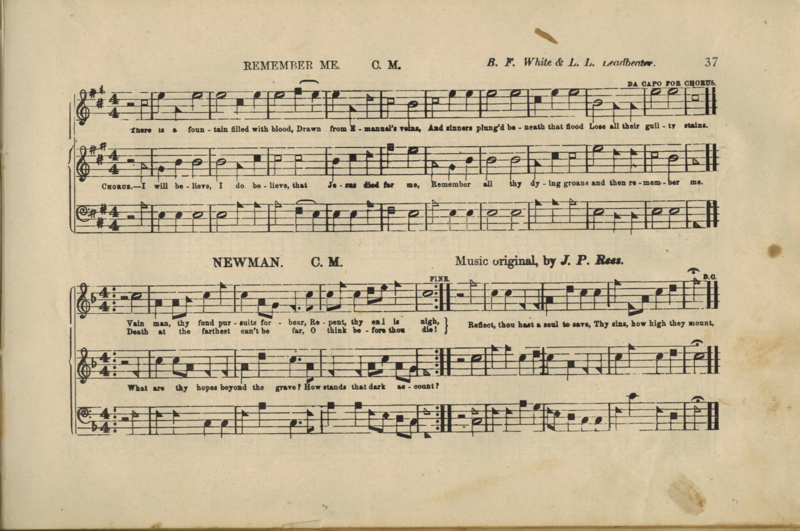 “Remember Me” and “Newman,” page 37 of The Sacred Harp, “Fifth Edition, Much Improved and Greatly Enlarged,” 1909. 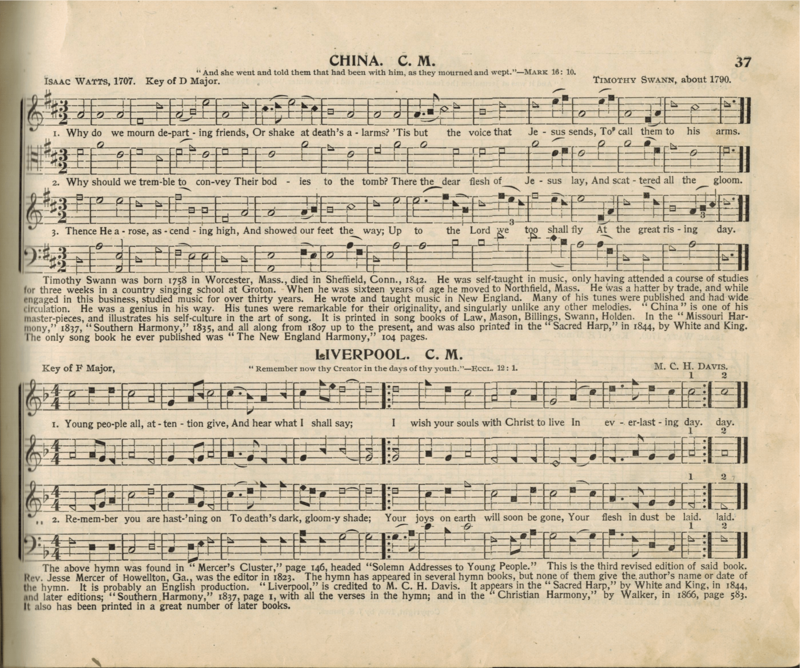 Yet in editions of The Sacred Harp he published in 1910 and 1911 (and later printings), White retained “China” and “Liverpool” but added an alto to “Liverpool” and reharmonized both songs. He also changed their keys: “China” appears set in Bb major; “Liverpool” in Eb major. 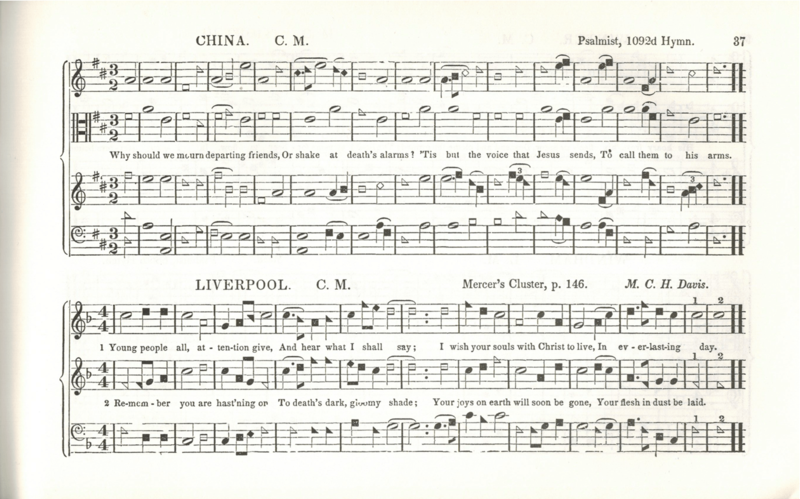 “China” and “Liverpool,” page 37 in The Sacred Harp, “Fourth Edition, with Supplement,” 1911. In the 1911 Original Sacred Harp, edited by Joseph Stephen James, both songs appear. As with White’s 1910 and 1911 editions, “Liverpool” appears with an alto part added, but both songs retain the keys and other harmony parts they featured in the 1870 fourth edition. Each carries an extensive historical note. 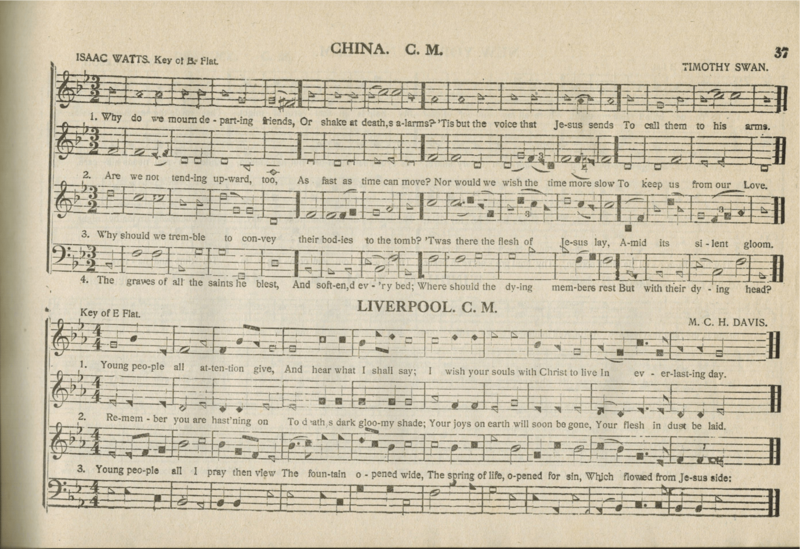 “China” and “Liverpool,” page 37 in Original Sacred Harp, 1911. 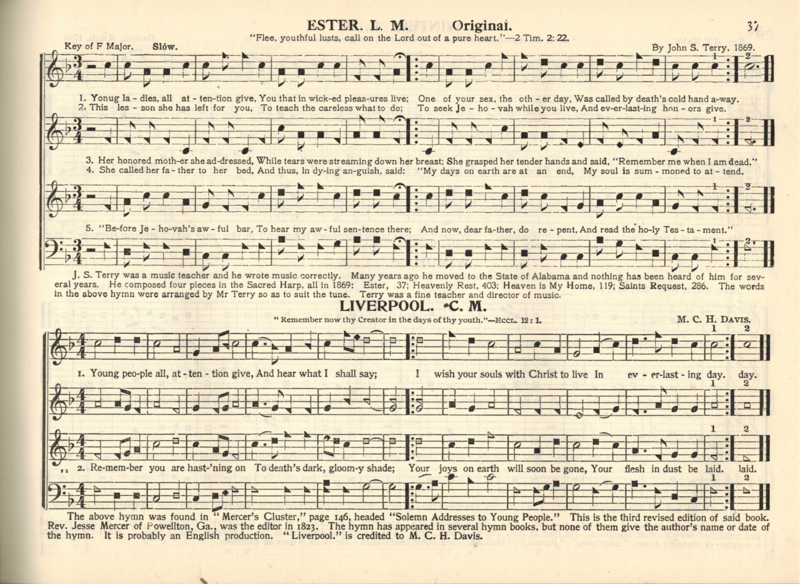 The 1936 “Denson book,” a revision of Original Sacred Harp by a committee led by members of the Denson family, retains the version of “Liverpool” included in the “James book” but shortens the song’s historical note. The edition also replaces “China” with a song “Ester” from elsewhere in the book. “Ester” and “Liverpool,” page 37 in Original Sacred Harp: Denson Revision, 1936. Denson editions through 1987 feature these two songs with this layout. In the retypeset 1991 edition, both songs appear, but with James’s historical notes removed. Enabling distinguishing among the nineteenth- and twentieth-century Sacred Harp editions, the major Sacred Harp revision-chains, and earlier and later editions within each chain, the “Page 37 Test” is a simple way to narrow down which edition a songbook belongs to. But you’ll have to look at pages other than 37 to narrow things down further. In fact, details of The Sacred Harp‘s publishing history are still emerging. If you’d like help identifying which edition an old Sacred Harp tunebook you have belongs to, feel free to contact me.